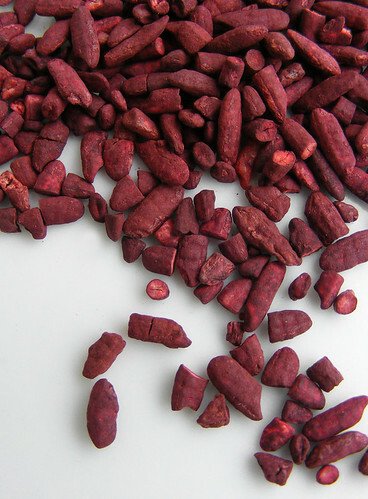 Red rice yeast is just normal, steamed, white rice which has been left to ferment for 4-6 dayes with the mold Monascus purpureus which colors the rice beautifully red. Red rice yeast is often used as natural food coloring, e.g. in fermented tofu , red rice vinegar and sometimes also in Char Siu (red bbq pork), Peking duck and all kinds of red, Chinese pastry. Besides that it’s used to color some Chinese, Japanese and Korean rice wines pink. You can also just cook your red yeast rice like normal rice (1 cup rice : 1½-2 cups water, for 25 minutes) and eat it for supper, although I can’t recommoned that as it’s bitter and has a metallic taste to it. If kept airtight you can keep red rice yeast for several months. Also read the article about : Fuzhou red wine with step-by-step instructions to make this ricewine at home. Because some claim red rice yeast is very healthy you can buy concentrated red rice yeast in tablets at drugstores and pharmacist. It’s supposed to influence your cholesterol, bloodpressure and digestion. Thin ones: rice vermicelli / mihoen / mihun / bihoen / bihun, mí fěn / 米粉 (China), banh hoi (Vietnam), sen mii (Thailand), laksa (Maleisia). To make (broad) rice noodles, rice flour (which is simply ground rice) is mixed with water into a slurry. This slurry, spread out in a thin layer is being steamed before it’s cut into different size. (see clip). Fresh rice noodles are soft and slippery, but in the West we mainly know them dried, which makes them a bit firmer. To improve texture or colour producers often add a little bit of corn flour or tapioca flour to the slurry. The (thin) rice vermicelli is often made a little bit different, a slightly thicker dough is being extracted into this strings and those strings are getting steamed or boiled. (see clip). Rice noodles are already prepared/cooked when produced, that way you don’t need to cook them at home. Normally it’s enough to re-hydrate them in hot or warm water. It depends on the thickness how long you need to soak them, usually you can find a good indication on the package. They just need to soften up. You can shorten the soaking time when you are going to further use them in soup or stir-fries. For soups you could even decide to rehydrate them in the soup. Soak to perfection if used for Thai salads, just rinse in cold water to stop the process, then add a litte (sesame) oil to prevent them from sticking together. When you deepfruy (175°C) rice vermicelli (unsoaked) it will swell up into crunchy strings. Sometimes you can find fresh rice sticks/sheets in the fresh department. They’re much softer and more slippery than dried noodles.